Well-placed for visiting a range of popular towns and cities, Arianella Bed&Breakfast +Apartment is a 150 year-old building now made into a b&b. 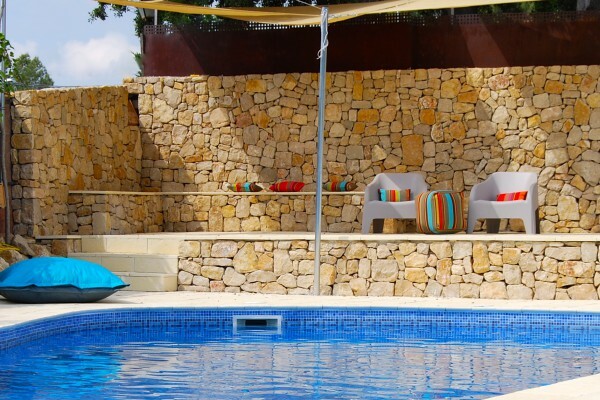 Both Barcelona and Tarragona are an hour away, while the major attraction for many will be the proximity to the vineyards and wineries of Catalunya's wine and cava region, which surround the masia (country house). One of the most famous names in local viticulture is Cordoniu, for their cava, and the masia is delighted to help guests arrange visits here and to various other wineries to sample the regional delights. The hotel has excellent views of the surrounding vineyards and provides a laidback atmosphere for its guests, a natural consequence of the friendly and relaxed welcome of the team servicing the guests. There are plenty of places to relax, be it under the sun by the swimming pool overlooking the green scenery all around, or in the courtyard under the shade of the trees. There is a beautiful jacuzzi, where you can get a relaxing masage whilst overlooking the valley. Each guest room is named after a Mediterranean fruit, and Ariane and Rainer have sought to give them all individuality, whether the variation is the addition of a four-poster bed, a private terrace or perhaps an open fireplace. There is even a self-catering apartment for four: this has two bedrooms (one double and a twin), a bathroom, open-plan kitchen and dining area and a living room with TV and DVD player and music system. It also has its own south-facing private terrace. The Arianel.la team can also arrange all kinds of excursions, both wine tours and many other suggestions that you may be interested in. Sitges with its beautiful white beaches is just half an hour away, as is the fantastic Vilafranca del Penedès with its spectacular culture of the ‘Castells'- shows of human castles in the square, with people climbing multi-layers high on each other's shoulders at fiesta time. There is also a wine museum in the town. A plentiful breakfast is served each morning. A homemade dinner can be prepared with prior arrangement from 6 diners onwards, always depending on the availabiity of the cook. 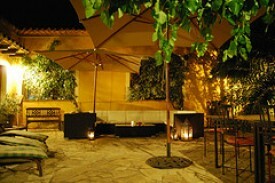 The kitchen can be used to prepare cold meals, and the courtyard also has a gas barbecue for the use of all guests. Double room with private bathroom, a rich breakfast included 97 Euros / night. Apartment with two double bedrooms, bathroom, private terrace: 700-970 week, 150 per night. Studio Apartment for 2-4 people, 109-129 Euros the night for 2 p.
For breakfast we offer fresh country bread, toasted bread, pastry, butter, marmalades, orange juice, "café con leche" or English breakfast tea, cheese, ham, regional salamis, fresh fruit and yogurt. Everything offered is regionally produced, the bread is hand made in our village as are the yogurts. This way you can start every day happily, reading, chatting, indulging and taking live lightly. We want you to feel at home as much as possible. Therefore, all guests can use the kitchen of the main house, so that they don´t need to go to a restaurant every night. The kitchen can be used to prepare cold food and additionally, there is a gas-driven BBQ in the court yard available. We kindly ask to consume the drinks from the self catering bar, where everything is available at reasonalbe prices. 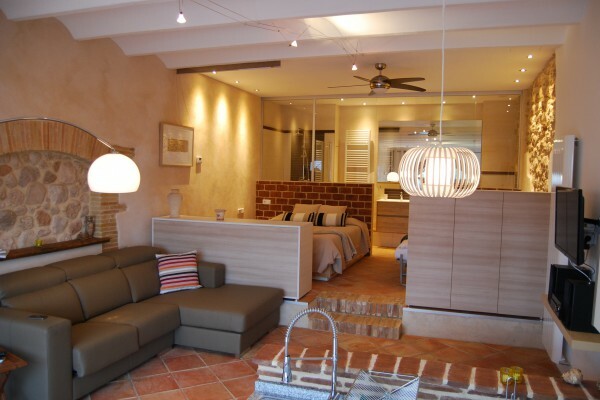 No experiences yet with Arianel.la Bed&Breakfast Penedes. Be the first! Did you stay in Arianel.la Bed&Breakfast Penedes? Let us know what you thought about it and help others to make the right choice! * I confirm having stayed in Arianel.la Bed&Breakfast Penedes. Find other bed & breakfasts in Torrelles de Foix, all bed & breakfasts in Barcelona or all bed & breakfasts in Catalonia.